I love decorating. I love our Christmas trees. I love celebrating. I think if you want to go big and all out, then do it. 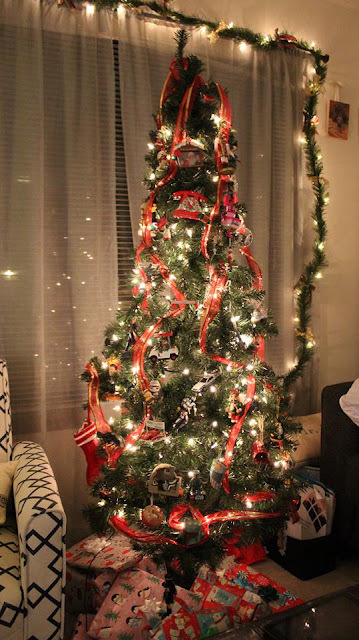 If you like to keep things easy and put up just one tree, that's okay too. 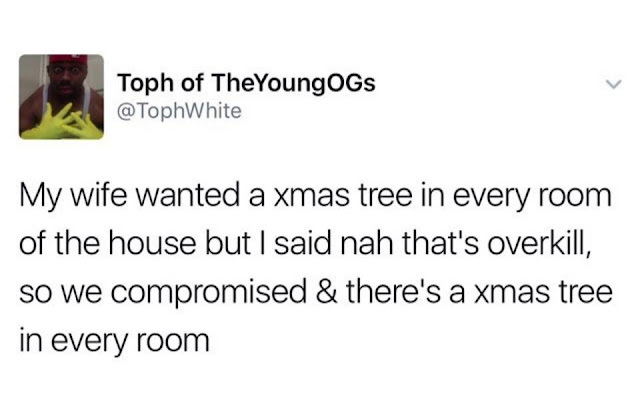 In our home, there's a tree in every room. Yes, I even decorate the bathrooms. I have memories as a child of coming home after school during the holidays to the Christmas lights on the trees, my Mom baking in the kitchen and our house being so cozy and decorated. I think that's why I'm so in to making every room so festive, it makes me feel like a child again and I want our home to be special too. 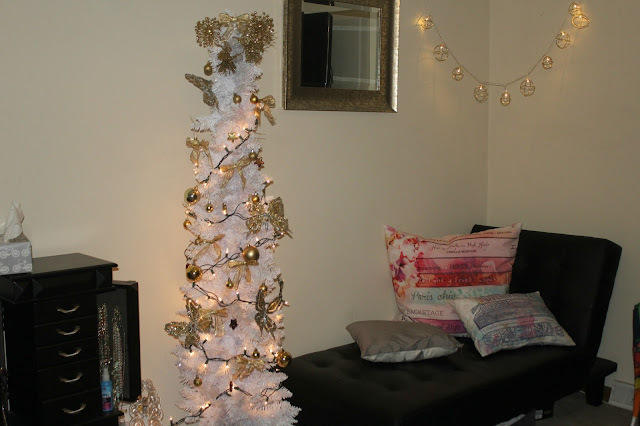 Today, I'm showing you a little bit of our home during the holidays. If only my photography skills were up there with my decorating skills. Let's keep "work on photography" on that things to do list for next year...again. Starting with the bathrooms...I like to make them real fun and work with bright colors and stray away from the holiday classics. I found some great bold colors at Target last year and couldn't pass up this blue reindeer with pink antlers. 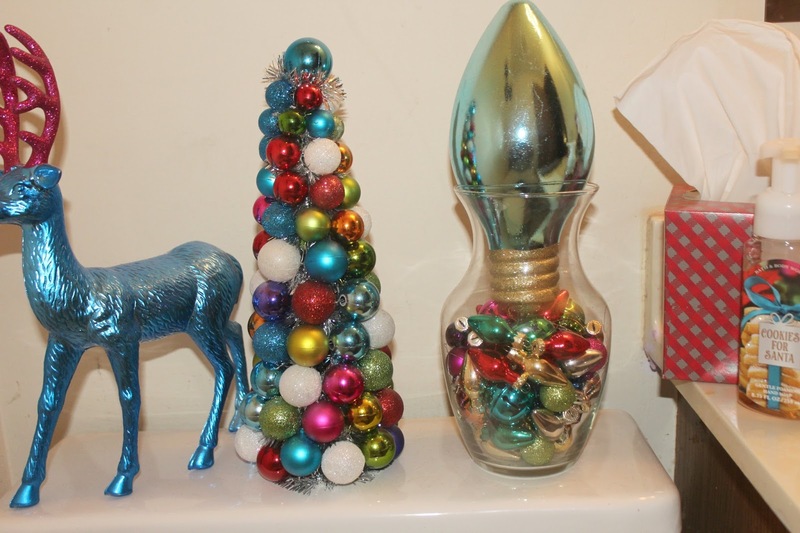 The giant bulbs I use in a few places, and put this blue one inside a vase with mini rainbow colored ornaments. 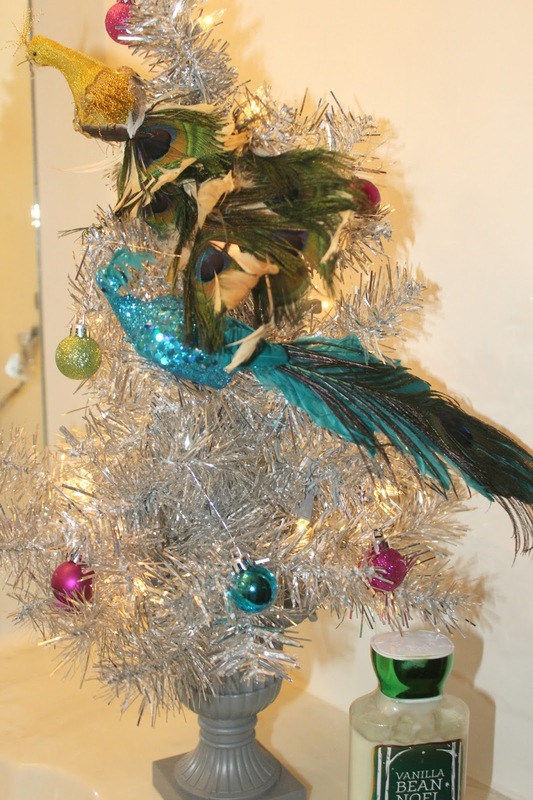 The second bathroom has a mini silver tree with some peacocks on it. I found these ornaments at Pier One...they always have great holiday items. The ornaments on this tree are small too, and I picked them up at the Target dollar spot a few years ago. I love having a tree in our bedroom...love love love it. Since our bedroom is white, so is our tree. I put gold ornaments on it and think maybe next year I will do something a little different. Just don't tell my husband. 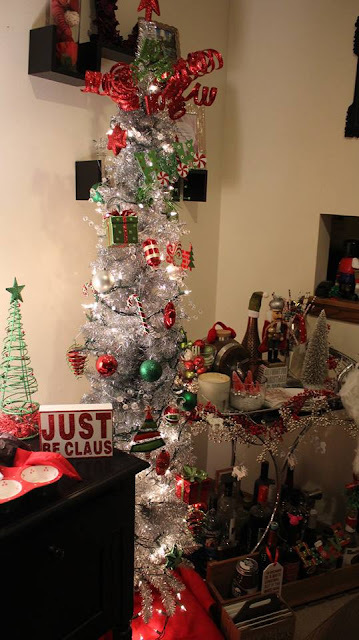 This is the first year I didn't put the coffee tree in the kitchen, so that room is pretty simple and laid back this year. I bring out this framed picture of Ethan every year because it reminds me of our old Christmas memories. That day we made peanut butter cookies since Chuck loves them. If you follow me on Instagram, you know I've shared several pictures of our trees in the dining room, but I just love them so much. I can't pick a favorite, but my vote is leaning towards the coffee tree. I even picked up a non Starbucks coffee ornament this year at Hallmark. I can't seem to find too many that aren't just Starbucks mugs, but am hoping to change that as the years go on. I added some new garland this year from the 2016 Starbucks red cups because they are SO fun and festive and I really enjoyed that there were so many different designs. I had some help drinking coffee at work and finally finished the last strand this past weekend. The silver tree is a classic favorite with red and green ornaments on it. Does anyone else love pencil trees too? I think the look is just great and is the perfect size for various rooms of your house. We don't do Elf on the Shelf anymore, but I keep him around. Plus, he's too cool in his aviator jacket and goggles and our friends kids like seeing him. I shared our Holiday Bar Cart decor last week on the blog, but what's a few more pictures?! I picked up a few new pillows and pillow covers this year. I got the furry white pillow in the Target dollar bin for $3. The red plaid cover and the white pillow cover with the car and tree decor came from Amazon for less than $5. Last but not least, our family tree in the living room. 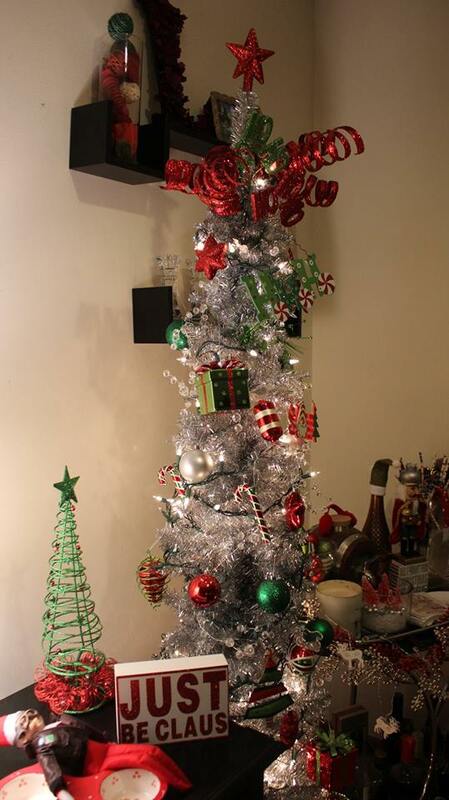 It's so fun collecting ornaments over the years and this tree is a hodgepodge of it all and I love that! I just had to share this picture I came across a few weeks ago, because it is my house-- 1000%...my husband definitely enjoyed it and we were both cracking up. This is going to be my last post before Christmas, so I hope you all have a wonderful holiday with your loved ones. I know I'll be hugging mine a little tighter this year knowing that our time spent together is the best gift I can ever have. Thank you all for your continued support, friendship, encouragement and love and for visiting and commenting. You all are so special to me and I hope your Christmas is all you dream of.